Thank you to Luv for letting us have part 11.
thanks as well luv and to those who have put thought into this thread. i'm reading here albeit slowly. best, to all posters here. Good for you , Penny! I bet if Ben did any metrics/session length on this thread, it would be obvious how much this thread means to a lot of guests and posters. Some dogs lick wounds for a living. Good work! Can we just stick with the facts this time around? Thanks. I know Menes, you have put so much time and effort into this. Thank you for doing that! Thanks, Luv4u and also to PennyPurple for making it possible to get a Part 11. If people still talk about JFK's death and he died nearly 55 years ago and other complicated deaths of public figures, then we should continue to talk about our thoughts about Prince's death as long as there is interest. But I read on the other thread this is the final thread for this which I don't agree with but the mods does make the final call. This thread gets most views than any other thread so apparently, there are still interest..
For the last two and a half years almost, I want to know what is in those four nas that I mentioned in other thread. I believe if we know, then I believed it would answer some of our questions about what went on with Prince during his final years. Notice Fentanyl toxicity was the first list of the four causes. So what were the other three causes? And noticed another na is also listed as other significant condition? What was that? That meant there were possible five causes total that likely affected Prince's health but only the publicly see one na which was Fentanyl overdose? I am surprised more people overlook those na's. I understand that some people are saying that the ME released information that was required by law and I have a funny feeling that trifling family of Prince probably told ME office to release little as they can as long as they followed the law to keep the public from knowing what went on wholely on Prince's health. Thank you for continuing this topic. I was watching a Musicology video and it just broke my heart, again, to think he isn't here. I want to know why. I think it's just a standard form for them to use. Some people have lot's of things that contribute to their death. I don't think it means he had 3 other things, it's just fill in the blank form. If the lawsuit goes ahead against the hospital in Moline and Walgreens, the full autopsy results might have to be revealed. I'm thinking these are all of the people who showed up to the scene that morning. Some names don't sound familiar, maybe they are Police Officers or EMT's. These are the investigations files released by the Carver County Sheriff's office on the overdose death of Prince. I think people forgot how many things and how many times we had to go back thru the warrants because of what we missed . A lot of times it appeared as though we were re-hashing the warrants, but in reality, there were so many bits of information that made a lot of things clearer once we figured it out. I personally had missed a lot of things and had to be redirected by a lot of posters. It only made sense to those of us who went thru it with a fine tooth comb. To the rest, we were re-hashing. When I took some time that one week to lay out each pill, PP contents, reason for usage, etc, it was to establish that we were no longer going to speculate when there was a wealth of information to gleam from. It was al we had. The last batch of released information, is much bigger, has more facts and will require more time to work thru it. A lot more time. Given that scenario, that is much different from say : A picture thread. How intriguing is it to rehash a picture when the picture has been posted over and over again? Yet, there have been a ga ziilion picture threads from the orgs inception. No one complains. An even more perfect example is the "anything Mani threads? That divorce happened in 2006. That is (12) years worth of threads! I don't hear the chorus chanting "take it down"for anything resembling such a thread. Have we not figured out how the divorce took place yet? Or how much of a gold digger she was? The list goes on and on. We only lost the man (2) two years ago , and that to me , remains the biggest gaping hole in the story of Prince. Let us have our days/months/ years like all of the other threads have. My contribution to this thread will be to do exactly as I did with the warrants thread some day. I believe that there are lot of answers to our questions in the recently released batch of information. Had it not been for it, our eyes would have still been glazed over about the actions of the many associates and friends of this man. We now know different in but a few months. co-sign and deep gratitude, and respect, for your efforts. No it means "not applicable" -- in other words, that the ME didn't find any other contributing factors. This wasn't overlooked; it was discussed here ad nauseum when this document was released 2 years ago. As we've discussed before, nothing on this document is redacted; there isn't another "non public" version of this short-form autopsy with additional information on it. 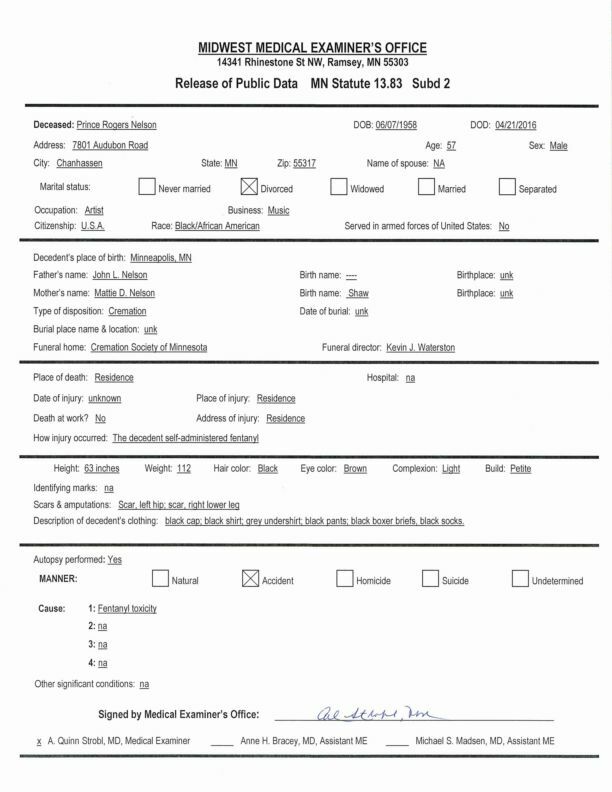 All the line items on this document are information that the state determines that the public has a right and interest to know (about any dead person in that state). I have looked at this list before Penny. I wonder why attorney Diana Frappier was at the scene when her practice is in California? Why was another attorney Gary Hansen also there? That clears up 2 of them then. How did Frappier get there so fast from Cali. That is very odd. She had to be already in town, but why? Who is Charlene Hayes and Karen Moore, and Valrie Hicks? great question, it's almost creepy...were staff lawyering up before his body had even been removed from PP? On the other thread somebody was asking what happened to his clothes. And this also includes the pills they found. Karen Moore is Kirk's sister. Well let's just throw a damn party. yet the grey undeshirt was intact.. This would indicate to me that they didnt actually start doing CPR. They CPR Patches were on his forearm and his legs..but not his chest ? I think it's just where they took blood and tested it. It's on a slide and they gave it back to the PD to be held in evidence. But wouldnt that be a SAMPLE rather than a STAIN ?? ?